The list of the top shrimp tapas must start with one of the most popular tapa in Spain must be gambas al ajillo, sautéed shrimp in garlic. There are many more shrimp tapas, and we've put together a list of the top recipes. Most are quick and easy, and some can be prepared ahead of time, so you spend less time in the kitchen and more time with guests. 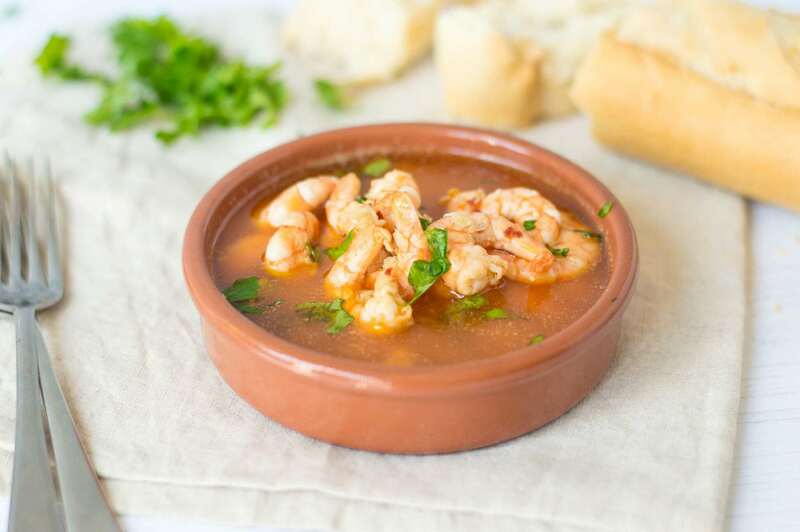 One of the most common tapas of Spain, gambas al ajillo is quick, easy and very garlicky. A classic tapa, that everyone enjoys. Serve with lots of sliced rustic bread to soak up the sauce. Gambas a la Plancha is a classic Spanish tapa recipe. Whole, unpeeled shrimp are salted, then cooked quickly on a flat iron grill. Squeeze lemon juice over the top and serve. Everyone will be licking their fingers with these, so have lots of napkins. Garlic Shrimp with Sun-Dried Tomatoes - Gambas al Ajillo con Tomates. (c) 2011 Lisa Sierra Licensed to About.com Inc. This tapa is simple, flavorful and a very colorful presentation. Sliced garlic and sun-dried tomatoes are sauteed together, then mixed with peeled shrimp and sprinkled with fresh basil. Serve with rustic bread. Mushroom, Shrimp and Chili Pepper Flakes. (c) 2011 Lisa Sierra Licensed to About.com Inc.
Setas or mushrooms are very popular in Spain. This tapa is so quick and easy to prepare - Combine shrimp with garlic, white wine and mushrooms for a flavor that is quite delicious.